There are weather apps, and then there are weather apps; Nooly is, apparently, the latter. Nooly is so accurate, its press release claims, the app “is capable of predicting the exact minute it will rain or snow and can do so effectively, wherever you are, for every 0.4 square miles.” That’s pretty precise. How does Nooly do this? 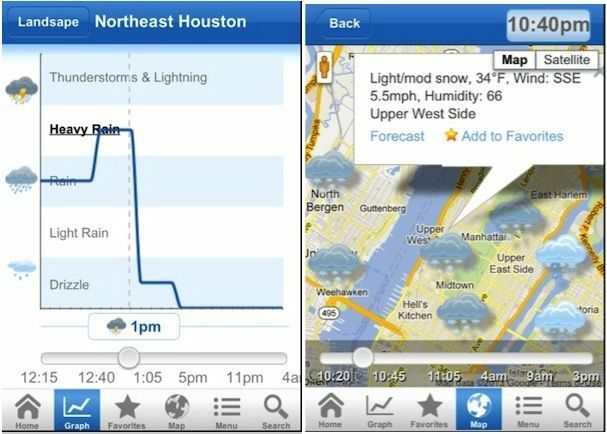 The app siphons data from a “new and experimental” radar network — which, up until now, Nooly says wasn’t available to the general public — set up by the National Oceanic and Atmospheric Administration, then uses a customized algorithm to produce weather predictions that are higher resolution in both location and timeframe. Using San Francisco as an example, This means the app can predict it’ll rain, say, ten minutes from now in the Mission District, but remain dry just down the road in Noe Valley. Again, all this is from the press release. Frankly, claims of a more accurate weather prediction system always have the same ring to them as claims that someone has found definitive proof that Sasquatch exists. But it’s free, so you can check it out for yourself. An Android version of the app can be found here. On the iOS side, Nooly’s release says it isn’t available for the iPad yet; but it looks like it is, as it’s a Universal App — although the iPad version’s UI looks a little low-rent.